By Design Interiors, Inc. | Houston Interior Design Firm — Eat, Drink, Love! it got me to thinking of how to better connect with our loved ones through Interior Design. As a family, we gravitate towards the “booth” options at restaurants. It is nice to be able to sit close to your special someone while you enjoy some good food and drinks or for your child to rest their head on your shoulder after a long meal. with a fantastic and unique pedestal and an unexpected punch of color. but it is so inviting you could easily envision a similar design in a home. 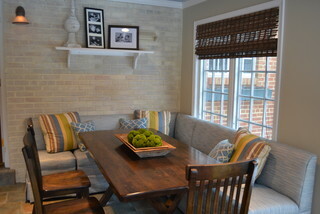 There are many ways to configure banquette seating. You can go with all benches, benches with chairs, and different shapes of tables depending on your space plan, family size and personal style preference. Banquette seating can also have convenient hidden storage. The bench seat can lift in order to store big items or you can have custom made drawers for the fronts or sides for easy access to everyday items. So if you are considering a kitchen renovation why not surprise your sweetheart or your family with banquette seating so you can eat, drink and love in style!